Lexmark markets the X2530 as an all-in-one photo printer with impressive speeds and versatile functions designed to work well in a small office environment or for home use. However, the Lexmark X2530 lacks sufficient media capacity to truly pass as an office printer. That said, it is more than ample for home and personal use. The Lexmark X2530 uses the company's signature Evercolour ink with the standard 4-colour ink cartridge system. It prints using thermal inkjet technology and scans with a CIS flatbed element. The printer is quite light at 4.73 kilograms and compact at 6.9 inches tall, 11.5 inches deep, and 16.9 inches wide. This colour inkjet printer is compatible with the 6-ink cartridge option, letting users enjoy more vivid and high resolution photo prints at up to 4800x1200 dpi. The Lexmark X2530 is speedy at 20 ppm in monochrome and 14 ppm in colour (draft mode). The scanner's lid can be lifted to accommodate books and magazines. The media tray's standard capacity is only 100 sheets, and the output tray can only accommodate up to 25 sheets, so this printer is not efficient for bulk printing. The Lexmark X2530 needs a better scanner than the current 36-bit flatbed CIS type because colours sometimes appear faded and lighter than the original, if not over-saturated. There is no automatic document feeder and duplex printing capabilities. 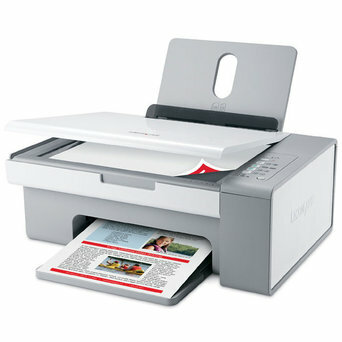 Lexmark calls it a photo printer, but the X2530 lacks direct-printing features like PictBridge and media card slots.